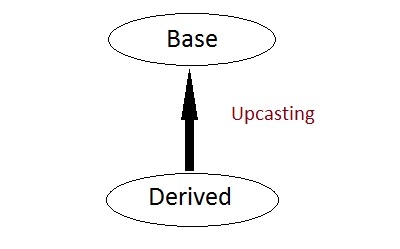 Upcasting is using the Super class's reference or pointer to refer to a Sub class's object. Or we can say that, the act of converting a Sub class's reference or pointer into its Super class's reference or pointer is called Upcasting. Also, assignment operator = is never inherited. It can be overloaded but can't be inherited by sub class. They are inherited into the derived class. If you redefine a static member function in derived class, all the other overloaded functions in base class are hidden. Static Member functions can never be virtual. We will study about Virtual in coming topics. In Multiple Inheritance, the derived class inherits from more than one base class. Hence, in Multiple Inheritance there are a lot chances of ambiguity. In this case both class B and C inherits function show() from class A. Hence class D has two inherited copies of function show(). In main() function when we call function show(), then ambiguity arises, because compiler doesn't know which show() function to call. Hence we use Virtual keyword while inheriting class. Now by adding virtual keyword, we tell compiler to call any one out of the two show() funtions. before class D's constructor, constructors of its super classes will be called, hence constructors of class B, class C and class A will be called. when constructors of class B and class C are called, they will again make a call to their super class's constructor. This will result in multiple calls to the constructor of class A, which is undesirable. As there is a single instance of virtual base class which is shared by multiple classes that inherit from it, hence the constructor of the base class is only called once by the constructor of concrete class, which in our case is class D.
If there is any call for initializing the constructor of class A in class B or class C, while creating object of class D, all such calls will be skipped.